It was the day of the 7.6 magnitude earthquake when we returned from Nicaragua to Costa Rica. 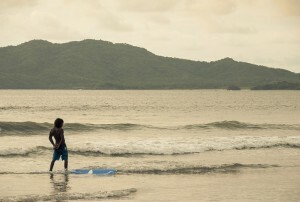 We would spend a few more days in Tamarindo, which is a small surfer town in Guanecaste (North West Costa Rica). 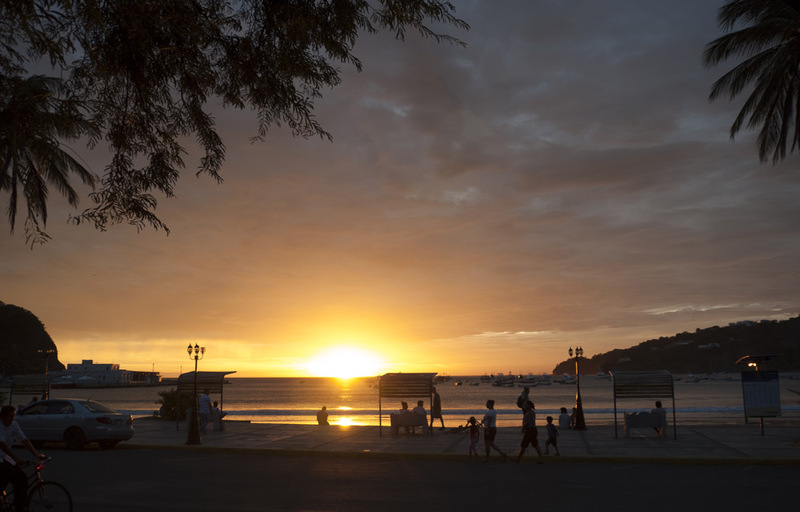 Tamarindo is much closer to the epicenter of the earthquake than where we were at that time. So, it wasn’t a big surprise to see some damage in the holiday home of Gabo’s grandmother where we would be staying. As you may know, I am into reptiles and in particular I love iguanas. I had a green iguana for many years (may he rest in peace). Today, I went with my La Fortuna friends here to a place that is great for watching green iguanas. They were quite big (and fat), much larger than any others I had seen in the wild. They were also extremely lazy and sleepy. They did not seem to appreciate my excitement about them. I’m again visiting my American friend D’Angelo in La Fortuna, the cute little town by volcán Arenal. There is plenty of activities to do around Fortuna and some of the scenery here is pretty spectacular. Today I went to the nearby waterfall Catarata la Fortuna. The waterfall drops about 70 meters and is located at the base of a dormant volcano. At the bottom of the waterfall is a small pool in which you can swim. Considering the fact that this is a river, the water temperature was surprisingly pleasant. I tried to swim to the center but there was too much water coming down, pushing you away as you try to get too close. What a shame. I would have loved to know how this kind of shower feels like. I am in La Fortuna, Costa Rica, a small town close to volcán Arenal. While the active volcano is hidden in clouds most of the time and too dangerous to climb, there are plenty of other outdoor activities. 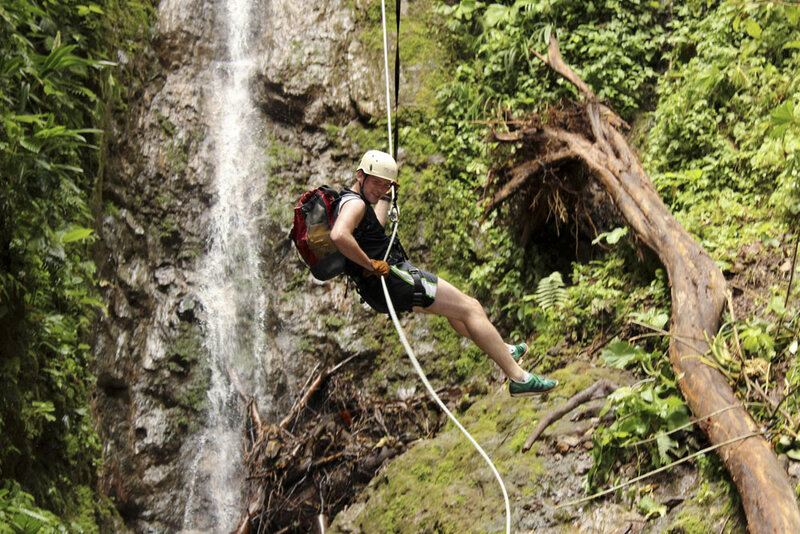 I went on a waterfall rappelling tour (or ‘abseiling’ how the New Zealanders would call it). You trek along a small river through the forrest with several waterfalls that you climb down on a rope. After spending a month in the San José area, most of the day on the laptop to earn some money for the rest of my trip, I really needed a break; get away from the computer screen and the city for a bit. 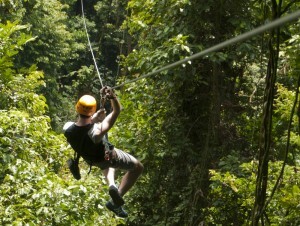 So, I decided to visit the Caribbean coast of Costa Rica of which I heard plenty of good things. 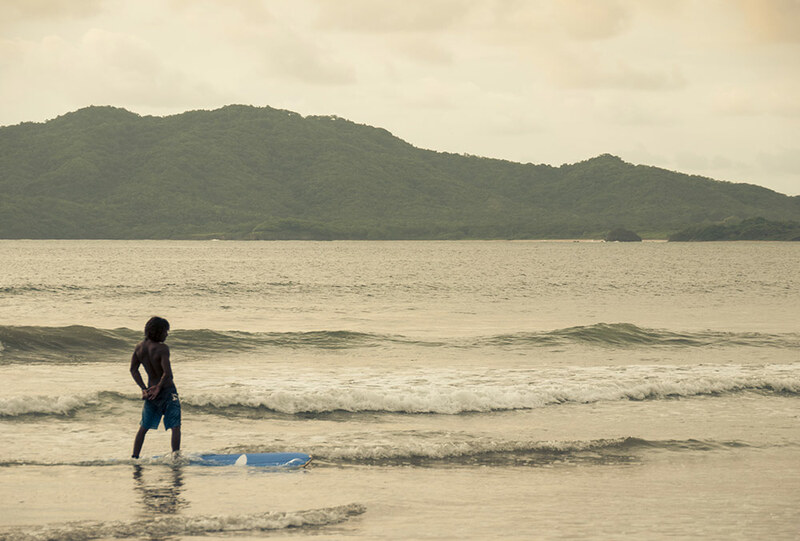 A four-hour bus ride later, I arrived in Puerto Viejo, a small village on the Caribbean that is overrun by party-hungry college kids, potheads and a couple of surfers. Looking for something more quiet and laid-back, I decided to settle a few kilometers further down the coastal road in Punta Uva at the ‘Casa Viva Beach Houses’. Not the cheapest place but the cabins were just a few meters away from a gorgeous beach. There were never more than a handful of people at the beach – but a few thousand sand flies. It felt like I got bitten by every single one of them. The water was great. I haven’t been swimming in the sea for at least a year. One of the places Marissa really wanted to visit was a certain coffee plantation she heard about from the Guatemalan owner of a fair trade store in Chicago. After recovering from the near-death experience of our Santiaguito volcano expedition we took a chicken bus from Quetzaltenango (or Xelahow the locals call it) to a small town called Colomba. Marissa was excited about her first ride in a chicken bus. These are old yellow US school busses that, after getting a more or less fancy paint job, are used as local buses all throughout Central America. The term ‘chicken bus’ stems from the fact that people use them to transport just about anything, including chicken (on our bus there were some chicks, too). From Colomba we hat to take a collectivo to the plantation. Collectivos are another interesting mean of transportation here. It’s basically a driver with a pickup truck that leaves whenever enough passengers have accumulated to fill the back of his truck. You get lot’s of fresh air, it’s almost like driving a cabrio, only that it’s a pickup and you share the car with at least 10 other people standing next to you… on second thought it resembles more an overcrowded subway. The next stop of my Guatemala trip was Flores, a beautiful small and sleepy town on an island in a lake. From there we went to the Mayan ruins of Tikal. If above picture looks somehow familiar to you it might be because George Lucas decided to use Tikal as a filming location for his 1977 movie Star Wars: A new hope. We left Flores at 4:30 AM to avoid the crowds and got to Tikal about two hours later. It’s my second visit there and thanks to the guided tour I got a lot more background info and animals to see this time.